PLEASE USE THE JAM AT THISWEBSITE DOT COM EMAIL TO SUBMIT YOUR ENTRIES AND SEND CODE. This thread got cluttered very quickly. If you are needing a direct download, we do NOT need the web stylings (the banner image and description) - these are ONLY for embedded games. The description of the game you send when you submit your entry by the deadline to the email address is what will go in the wrap-up article. 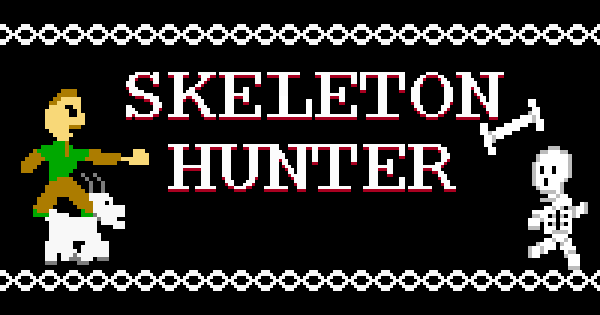 Skeleton Hunter is done and actually already up on VOG Arcade! Thanks again. Here are the final versions of the embed code, banner, and description text. <br><a href="https://www.google.com/chrome/">Google Chrome</a> is recommended. Other browsers may not support gamepads, and you may need to click on the game first before you can play it. <br>All code, graphics, and sound by <a href="http://hitstun.bakamostudios.com/">Jonathan Landis "Hitstun"</a> using <a href="http://notepad-plus-plus.org">Notepad++</a>, <a href="http://www.mapeditor.org/">Tiled</a>, <a href="http://www.gimp.org">GIMP</a>, <a href="http://famitracker.com">FamiTracker</a>, <a href="http://www.bfxr.net">Bfxr</a>, and <a href="http://audacity.sourceforge.net">Audacity</a>. Edit: Oh whoops, I can't read. Spoilered the whole post.